This community update from Facebook just drives home Zuckerberg’s remarkable achievement. 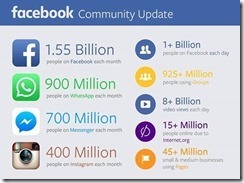 A billion individual people use Facebook every day. They watch an average of 8 videos each. Every day. It’s a huge number. Those people are communicating with their friends, making connections, being their own news editors and storytellers and sharers. Our relationships now exist in a hybrid world of physical or digital. It’s a fundamental shift which is why our sense of value, and our sense of what we will choose to spend on, is changing so much. If you spent money in the real world (once you are past basic needs like shelter and food) with a social context, so you will spend money in the virtual world when you have a social context online. For a billion people, Facebook provides that online, virtual context.